Michael O'Leary, Ryanair's Lord of the Fees, has done it again. He has decided to raise fees on checked-in luggage and charge money to use toilets. That means more discomfort for travelers and more money into his pocket. 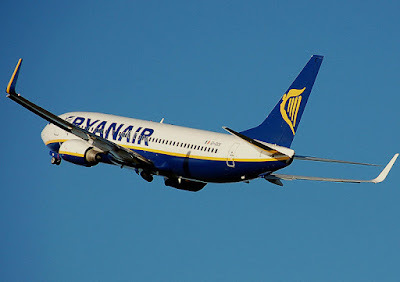 Ryanair has decided to increase fees for checked in luggage to 20 GBP. In addition to this, the air carrier has asked Boeing to modify its vessels to introduce payment to use toilets on their planes. Three toilets will be replaced by new seats, and passengers will have to pay 1 GBP / EUR to access the remaining toilet. Enjoy Food & Travel has remarked on the toilet fee on previous occasions. What seemed in the beginning to be a joke, will now be reality. Passengers traveling on vacation may experience higher prices and personal discomfort when traveling on vacation with Ryanair. A good idea for everyone planning a trip with Ryanair, will be to check all fees when booking and also calculate traveling expenses and time traveling from airports off the beaten track to their destinations. You may end up surprised. That bargain trip may not end up that cheap after all.